Painter Carole Bayer Sager is that rarest of creatures – an artist proficient in a variety of media and equally at home in them all. 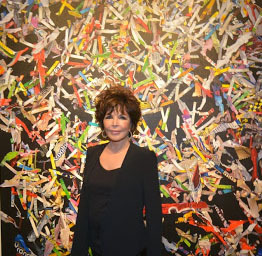 On the heels of a brilliant, decades-long career as a songwriter and singer, Bayer Sager has burst onto the visual arts scene with the same disarming flair with which she first stormed the pop music world during the 1960s. With New Works, currently on view at William Turner Gallery In Santa Monica, the artist has convened her third major exhibition in a few short years, amply demonstrating painterly abilities on a par with her prowess in the field of music. This painter’s latest output reveals a consistent, integrated vision and a technical virtuosity usually witnessed only in those with years of experience. From nowhere, Bayer Sager has emerged a polished and elegant artist like a caterpillar that has skipped pupation and emerged from its chrysalis a fully formed butterfly. Having previously made triumphant forays in such genres as portraiture and abstraction, Bayer Sager has recently turned her attention to the still life. New Works showcases the artist’s versatility with an array of paintings focused on food. At the forefront of these compositions is the fact that food is a commodity which appeals to almost all the senses at once. Descriptive and interpretive at the same time, Bayer Sager’s New Works explore the visceral effect and capture the charisma exerted by the sight, smell, taste and texture of candy, pastry, pizza, and other comestibles. Bayer Sager’s approach to her subject matter is a postmodern melange of neo-pop, photorealism and a bit of finish fetish thrown in for good measure. Her New Works teem with references and allusions to conspicuous consumption, commercial packaging, mass culture, and the mystique of taste and human appetites, all served up with a humorous whiff of decadence. While simultaneously mocking and celebrating the pleasures of the palate, Bayer Sager’s New Works effervesce with protean crescendos of color and confetti-like showers of shredded candy wrappers and savory snacks lusciously enmeshed in a parfait of delectable jellies, syrups, taffies and nougats and smothered in an intoxicating mousse of frostings, toppings, and melted chocolate. The optical cues in this gooey gumdrop aesthetic have the decorative aspect of jewelry but elicit an elementary physiological response in the viewer: with their verisimilitude and precision in conjuring physical texture and their invitation to fleshly indulgence, these paintings look good enough to eat. Bayer Sager probes below the surface of things, however, and peels away another layer of appearances in an effort to discover what gives these edible substances their appeal – she searches out their essences at close range, as if intent on examining them microscopically. In a curious exercise in scientific impetus matched by poetic realism, she brings the viewer into extreme proximity with the subject in order to scrutinize its constituents, evoking a lyrical quality while unveiling a universe in a Hershey’s kiss. An exemplar of creativity and a humanitarian who has supported many important charitable causes, Carole Bayer Sager is a force of nature. Having made her mark in several disciplines already, who knows where this charming, multi-talented artist may be led by her muses next?